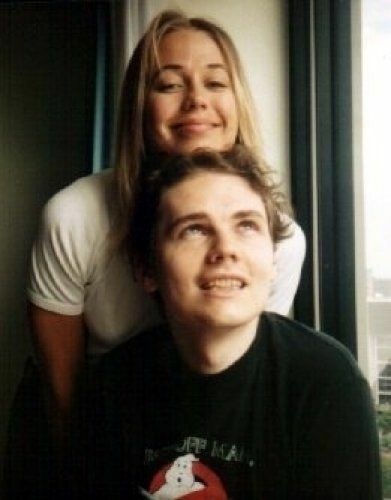 In 1993, Billy Corgan married his long-time on-again, off-again girlfriend Christine “Chris” Fabian, a museum artist. They were married at a small ceremony at his house in in Chicago. The Smashing Pumpkins songs “Soma” and “Muzzle” are dedicated to her. There aren’t many photos of Chris Fabian floating around but we did find this one of her and Billy in happier times. This is not Chris Fabian as previously stated. The woman in this photo is Fiona Horne, an Australian singer, rock musician, radio and television personality, actress and author and friend of Billy Corgan. Here’s a recent photo of Horne, who let us know in the comments section below that she is the woman in the photo with Billy but states that she did not have a sexual relationship with Corgan. But in 2005, he described some of the circumstances of his marriage in his online Confessions. In the confessions, Billy states that he was hurt that Chris did not take his last name after their marriage.